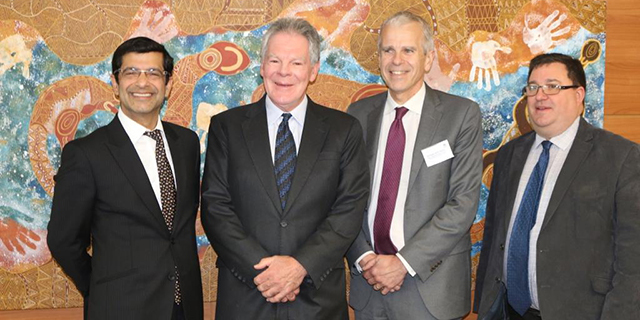 (L to R) University of Melbourne's Medicine Dentistry and Health Sciences Dean Professor Shitij Kapur, Deputy Chancellor Ross McPherson, Medical School, Head, Professor Geoff McColl and Department of Rural Health, Head and Medical Student Education Director, Professor Julian Wright. Photo Supplied. While in Shepparton Prof Kapur toured the campus and met staff and students and spoke formally to staff, students and community leaders at an afternoon address. Prof Kapur spoke about the future of medicine and the faculty’s vision for the rural clinical school. Prof Kapur said ‘The campus was a great initiative and it was good to see so many students eager to participate in a rural placement at Shepparton’.